This is the card that came with Sonny's love letter to Cathy Cox supporters. Think this is the message he hoped for? Nice try indeed. 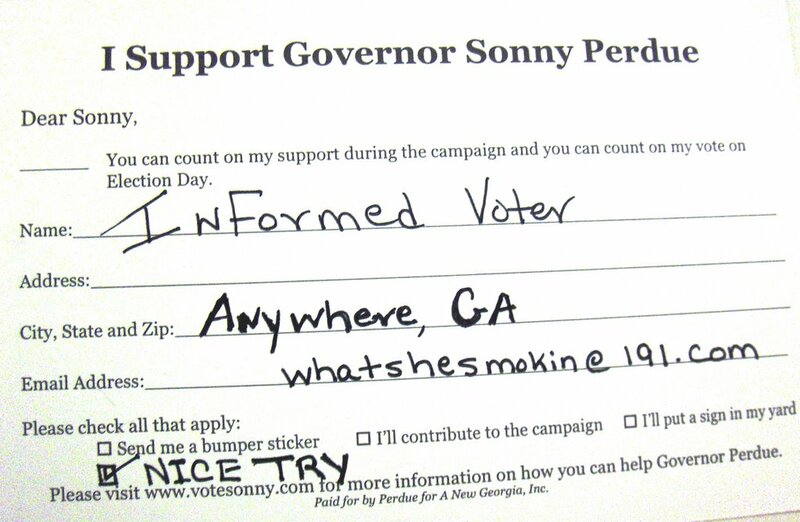 I followed your example and filled out my card the same way and sent it back to his campaign. That must have gone out to the whole CC donor list. I faxed a copy to Cathy. And this is the same guy who evicted her from offices in the capitol building. "Perdue must look back with some regret at his litany against Barnes. After Perdue moved into the governor's suite, he became the first governor in history found in violation of state ethics laws, a breach for which he was heavily fined. The Perdue administration imposed stiff state restrictions on local school systems. Class sizes and state expenditures were rigidly mandated. Perdue offered a record $400 million in state inducements to Korean automaker Kia to build a car factory in West Point. Barnes had offered $320 million to DaimlerChrysler for a plant at Pooler. 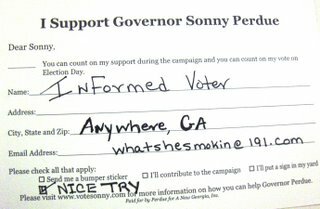 In addition, the campaign fundraising activities of Perdue and the Georgia GOP dwarf the Democrats' efforts four years ago." No, Gov. Perdue, you're no Cathy Cox. She set ethics standards while you broke them. She sought to give opportunities to teachers and students to be successful while you made their jobs as tough as possible. Cathy urged you to go to Detroit and save Hapeville's Ford plant while you went well over the top in buying a Kia plant.....KIA!! Frankly Sonny, you can't even tote Cathy's purse when it comes to those issues. And you won't be getting my vote in Nov., Mark Taylor will. We could cost the Perdue Campaign a little money with a coordinated effort to return the pre-paid cards with similar responses. Maybe we could suggest that to our readers. i strongly urge all CC supporters to do what you say Amy. that would be a way to drain some of his warchest. My response to Sonny was 'I know Cathy Cox and you're no Cathy Cox! Bottom line is that Cathy Cox needs to immediatly come out and support Mark Taylor. She needs to be gracious and prove she's a loyal Democrat by urging her supporters to work for the election of a Democratic Governor. Unless she does that immediately, the rumors will persist that she's too cozy with Sonny.